In this video we will wrap up Angular 2 course and also get an idea of what we plan to do next. As you have seen throughout the course, Angular provides consistent set of patterns for creating components, pipes and services. As we already discussed in our previous video, from a developer standpoint, there is no much difference between Angular 2 and Angular 4. The way we create an angular application is very identical whether we use Angular 2 or Angular 4 version. Angular 4 is simply the next version of Angular 2. All the angular concepts that we have learnt so far as part of this course are still valid, and we can still use those same concepts to build angular applications using Angular version 4. A short course on a tool called Angular CLI. Angular CLI is a command line tool, that help us create, build and test angular applications faster and with great consistency while following angular conventions and best practices. This tool generates the boiler plate code in no time for components, directives, pipes, services etc. I personally think Angular CLI is an extremely useful tool and every angular developer should know how to use it as it greatly improves our productivity when developing angular application. As part of this short course on Angular CLI, we will learn everything we need to know to effectively and efficiently use this tool to improve our productivity while still following angular best practices and conventions. How to perform CRUD (i.e Create, Read, Update & Delete) operations in Angular. To learn all these CRUD operations we will create a form that looks as shown below. 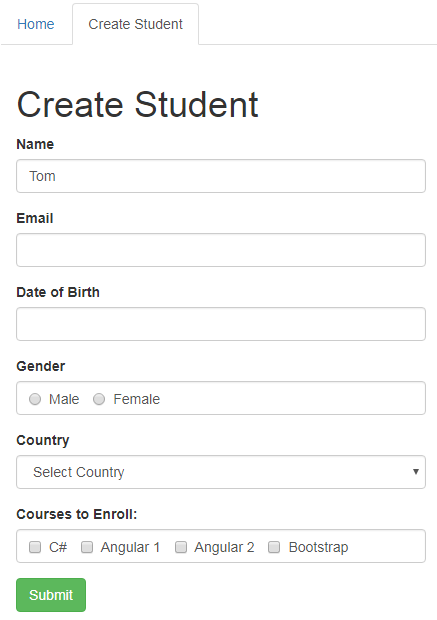 Along the way we also discuss form validation and working with different HTML elements like textboxes, radio buttons, checkboxes, select list etc. We will also discuss using third party form controls like Datepicker, Rating control etc. If you have a comment, question or would like us to include any other angular concept in our upcoming courses, please leave them as comments on this video and we will surely include them. So please stay tuned for our upcoming new angular courses. First I want to thank you for excellent videos. I wonder if you can explain change detection topic both default and push? Connection to immutable objects etc. Please show large file upload with real time progressbar with Angular 2/4. Can you please create some videos on authguard angular 2. Could you please share authguard in angular 2.
ans also token based login. Whether UI reouting is possible in Angular 2? Could you please provide some sample videos?